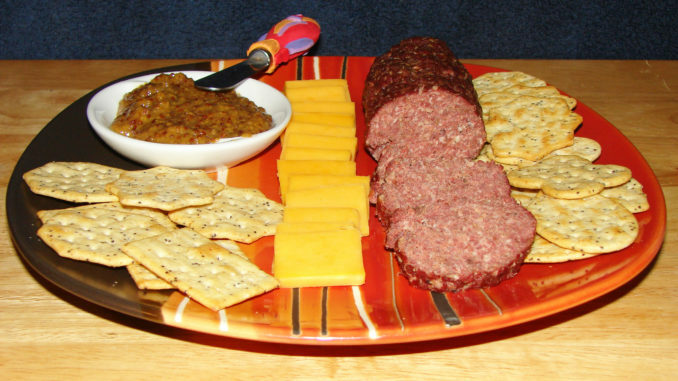 A spicy mustard, cheese and crackers are perfect additions to warm summer sausage. 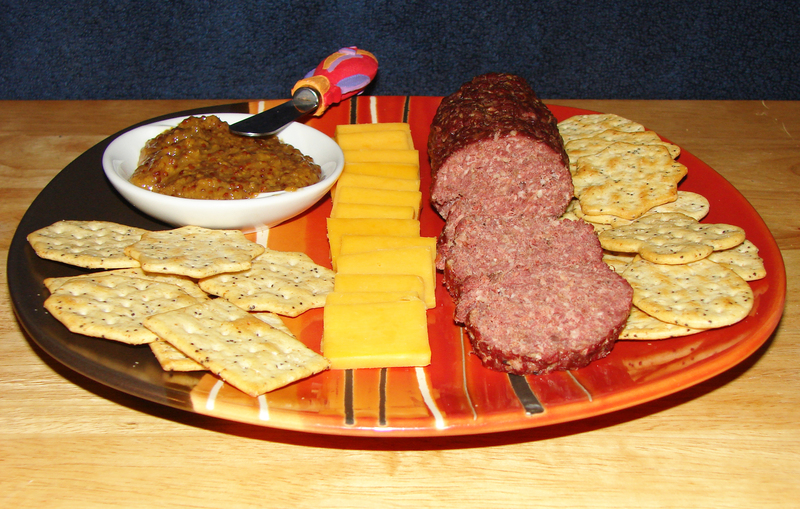 Simple venison summer sausage can be made spicier or milder by adding or limiting items like pepper, liquid smoke or other “tang” items. 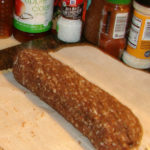 A sushi mat covered in parchment paper is the perfect surface for rolling summer sausage logs. Granddad had a lot right with that simple saying. Venison is lower in fat and doesn’t have any of the drugs, steroids and hormones fed and injected into most farm-raised animals. 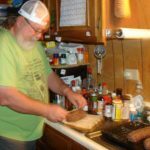 The holidays are approaching, and regular readers know I like to offer a special game or fish recipe to help celebrate the Christmas and New Year seasons; this year it’s a venison summer sausage. Some folks like to call this a beef (venison) stick, and that’s okay. 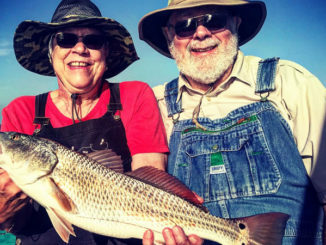 You should absolutely make some for your family, and it’s a real treat to share it with your hunting and fishing buddies. 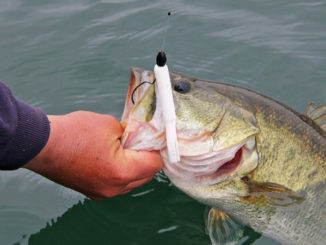 I believe that including game and fish recipes in Christmas and New Year’s party treats is an excellent way of celebrating the game and introducing new people to it. Whatever you do, don’t hide that the dish is made with game and then surprise someone after the fact. Even if they like it, that is a negative. Many folks are invited to gatherings during this time, and this is a great treat for them — only if you make sure the folks there know it is venison, not beef. People have a variety of reasons for not eating venison, and we should respect them. It can also be embarrassing when the non-hunter at the party begins raving about how good your beef stick is and someone points out it’s really venison. This dish is good for other occasions, too. I’ve noticed it tends to disappear quickly served with cheese and crackers when friends tailgate or gather to watch sports on TV. I call this basic because that is exactly what it is. 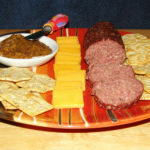 This is a summer sausage you can serve to anyone, well, anyone who enjoys eating venison. 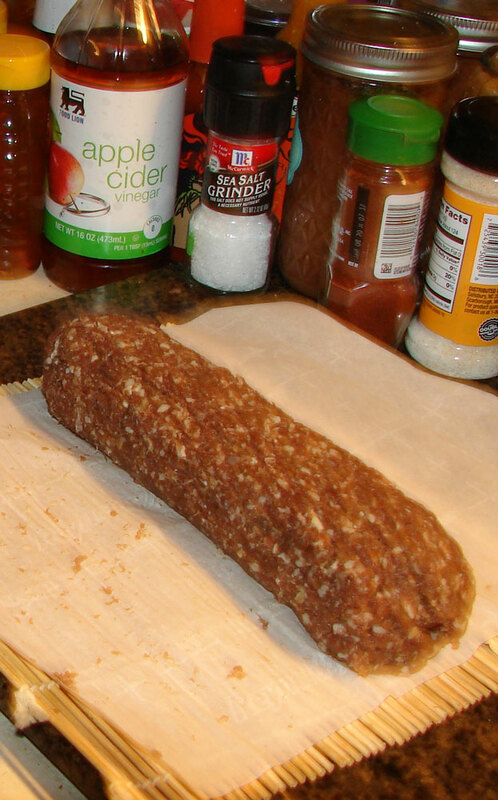 Unlike most sausages, there isn’t a casing; the outside crusts and holds it together. There is a little salt taste and a little garlic taste and a hint of smoke and pepper, but that’s all. It is extremely mild and shouldn’t be too strong or spicy for anyone. Because there isn’t a primary spice or ingredient flavor, it pairs well with spicy mustard for those who enjoy a little more bite. This recipe is extremely simple. It takes a little time, because there is mixing and curing, cooking and cooling, but there aren’t many ingredients or steps. One warning is to be careful with the liquid smoke. I’m all for experimenting and adjusting recipes to personal tastes, but a little liquid smoke goes a long way. The most difficulty I have with this recipe is finding the Morton’s Tender Quick Curing Salt. Most specialty shops and some larger and specialty grocery stores have it. It can be ordered online. You only use a little, and it freezes well, so you won’t have to purchase it often. This recipe is also very versatile. You can add more salt, more pepper or red pepper, more garlic salt, more liquid smoke, plus, you can add ingredients that aren’t on my the list. I make a batch every year and get three rolls for a Christmas party, Christmas Eve snacks with the family and have one in reserve for something unexpected. If nothing else comes up, it makes a great tailgate snack for a college football game. I also make several batches for myself and my friends who enjoy spicier foods. One of the simplest things to do is to add more or red pepper. I sometimes also add ground chipotle or jalapeno peppers. Chopped peppers and cheese work well. 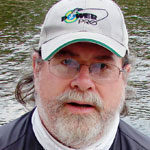 Jalapeno and cheddar is a favorite of several of my hunting and fishing buddies. I’m sorry, but I can’t remember who first shared this recipe with me, but none of the friends I’ve asked can recall, either. I guess we’re just getting old and forgetful. I have to thank to my wife, Donna Mooneyham, who came up with the idea to use a sushi mat covered with parchment paper to form the rolls. My rolls had been lumpy for years, but it must not have affected the taste, as no one complained. Now, many folks ask how I get them so round. One friend insisted I was packing them in paper towel tubes and then peeling the cardboard off. That’s a novel idea, but I find the sushi mat works very well. I don’t have a smoker, but I’ve often wondered how this would taste cooked in a smoker. I cook it for 3 1/2 to 4 hours at 225, and that’s a perfect temperature for a smoker. 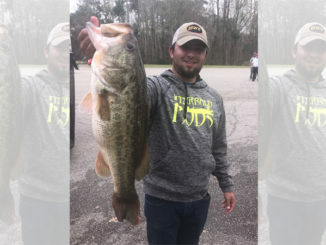 Maybe someone will try it and let me know, or offer their smoker to cook a batch? Whether you choose to make this summer sausage basic or add other ingredients, I believe you’ll like it. It’s also as simple to make as it is good to eat. Options: extra pepper, extra garlic salt, extra liquid smoke, red pepper, ground chipotle or jalapeno peppers, chopped jalapeno peppers, grated cheese and more. Using a large bowl, thoroughly mix the Morton’s Tender Quick Curing Salt into the ground venison. Cover or seal the bowl and refrigerate for a day. Mix in the black pepper, garlic salt, liquid smoke and any optional ingredients. Reseal the bowl and refrigerate several hours or overnight. 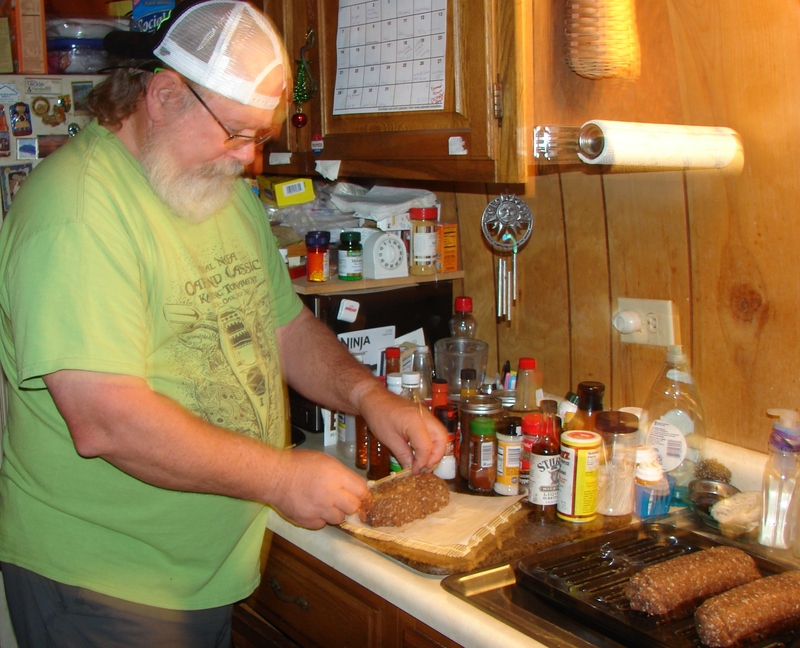 Use a sushi mat covered with parchment paper to roll the venison into 3 equal-size rolls. Preheat oven to 225 degrees. Place venison rolls on a broiler pan (or rack) so grease can drain as they cook. Cook for 31/2 to 4 hours. Allow rolls to cool and then refrigerate (or freeze for later use). Serve cool to room temperature with crackers, cheese and spicy mustard. This is a great hors d’oeuvre or snack. It is versatile and can be made mild or spiced up by adding more or different ingredients. It is excellent for family gatherings, parties, tailgating or watching sports in a hunting/fishing lodge, man cave or the den. Spicy mustard is a must condiment to accompany this, and there may be other personal favorites. My wife prefers it with the lighter taste of Sociables crackers, and I like a variety of whole wheat crackers.